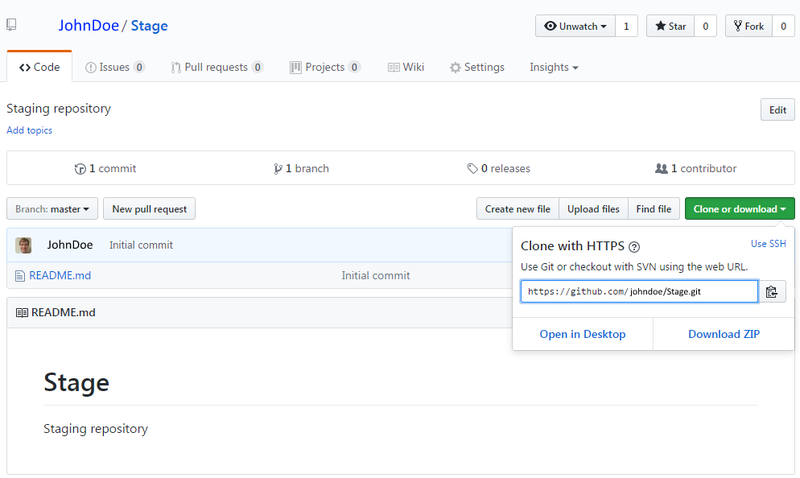 Use the git clone URL command to download the repository. remote: Counting objects: 3 done. The dir command will show that the files from https://github.com/johndoe/Stage.git have been downloaded to the local PC. Move into the Stage directory, and then use the git remote command to determine the alias of the remote repositiory. When changes are made to the files in the GitHub repository, the git fetch name or git pull name commands can be used to download the updated files from the repository to the local PC. The git fetch name command will download but not merge the files into your branch. The git pull name command will download and merge the files. After making changes to files on your local PC, the git push name command will upload the files to the remote repository.